A new book from Amy Chua and Jed Rubenfeld seeks to explain why some groups succeed in America, and some fail. But when does cultural pride cross over into racism? 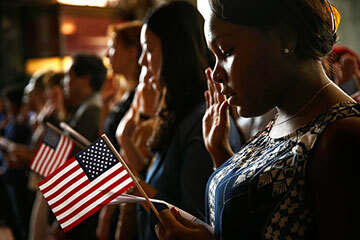 Vishaun Lawrence of Jamaica during a naturalization ceremony in Chicago last year. From time to time, every Indian American finds an email in his or her inbox, wearing a font of many colors, like the one my grandfather once sent me: "Take a Pride--Being an Indian. 38% of Doctors in U.S.A. are Indians. 36% of NASA employees are Indians. 34% of MICROSOFT employees are Indians. India invented the Number System. Decimal Point was also invented by India. Sanskrit is the most suitable language for computer software ..."
On my desk now is a book-length version of such an email: The Triple Package: How Three Unlikely Traits Explain the Rise and Fall of Cultural Groups in America, by Amy Chua and Jed Rubenfeld. You may remember Chua as the "Tiger Mom" whose 2011 memoir about the rigors of Chinese parenting set off waves of anxiety among aspirational American parents who had been raised with Dr. Spock's permissive child-rearing attitudes. Her new book, co-authored with her husband, widens its aim, purporting to explain why not just Asians (like Chua) but also seven other groups--Cubans, Jews (like Rubenfeld), Indians (like me), Nigerians, Mormons, Iranians and Lebanese--are superior when it comes to succeeding in America. The book claims that these groups thrive because of three traits: a superiority complex, insecurity and impulse control. The ones lacking the "Triple Package" are African Americans, Appalachians, Wasps and pretty much everybody else. Does such thinking shock you? If not, it may be because it has become so insidiously commonplace over the past decade as a new strain of racial, ethnic and cultural reductivism has crept into the American psyche and public discourse. Whereas making sweeping observations about, say, African-American or Hispanic culture--flattering or unflattering--remains unthinkable in polite company, it has become relatively normal in the past 10 years to comment on the supposed cultural superiority of various "model minorities." I call it the new racism--and I take it rather personally. I am an American, Calcutta born. I'm writing a book about immigrants in New York, dedicated to my two American sons. I want them to know why we came here and how we found our place in this new land. I want them to know about the teachers at the Catholic school in Queens who called me a "pagan," and the boy there who welcomed me to the school by declaring, "Lincoln shoulda never let 'em off the plantations," and the landlord who welcomed us to the country by turning off the electricity. I also want them to know why their family did well in the end. We worked hard, yes, and we read books and went to the right schools and are "well settled," as our relatives back in India describe us. But we also benefited from numerous advantages--from cultural capital built up over generations to affirmative action to an established network of connections in our new country--none of which had anything to do with racial, ethnic or cultural superiority. When my family went to America, we left behind a system in which people are often denigrated because of their caste, religion, language or skin color. The U.S., of course, has its own deeply troubled history with regard to race, but its path has tended toward more equality.